This day has gone on ridiculously long. We should end it soon so we can get it over with. Let's try and have all these arcs at the party wrapped up by the end of this weekend, ok? Also, it sounds like we've agreed on a timeskip after day 4, which I'd like to try and make quick. Let's place the dungeon crawl during that time. After the Timeskip, it will be mid July or so, a hot period of the season. Last edited by RockstarRaccoon on Fri Jul 09, 2010 4:14 am, edited 2 times in total. Sounds great. Im looking forward to a new day. New bio. Tell me what you think. You may introduce 1 of them tomorrow in the RP. Erm... Jimmy James isn't really a character I'd rp a lot. He's like the human owners. Just kinda part of David's story... They live together... So they'd both be moving in. I would only bring Jimmy out of the house for special occasions. Still he's the oldest pet X3. Psh. Why kid? That actually sounds pretty humorous. Not anytime soon though me thinks. Yay KyliexPifer! lol I just had to say it. I love following those two. Ok, that'll work. Go ahead. Do it with Rikki. Rikki's an adult. Kytes - Sleeping near the front door, curled up. lol, maybe not in those words, but I'll take the advice. Joy blushed a little, she took the controller in her hand and tried again, it traveled straight down the lane toward the first pin. "Come on! come on!" She looked at the game eagerly. The bowling ball exploded half-way down the lane into small pieces. the words "You fail" showed up on the screen. "How the heck!?" Joy yelled. "That's it, both of you are going to hug each other and you're going to like it!" Rikki jumped on top of them, forcing them down onto the bed so that Felix was on top of Shep, keeping them in an embrace. "Smell each other's fur and tell me you like it!" Be creative. What would a girl do if the guy she was staying with came home with back split open? don't have him come home at all! lol That'd be awkward. I wonder what her reaction to that would be. Ok guys, GREAT response to that call. Looks like the day's gonna end on Sunday. Just a few more characters I'm stalling for, and we can all go to bed, lol. Just to let you know, this plan is already in action. Ok, so it looks like everyone's pretty much done with their day except for my two groups. I'll go ahead and end this day now. Anyone who's characters are still awake go ahead and just say what happened without RPing it out in your post where they wake up. In any case: Day 3 is Over, Day 4 has begun! Felix has always had a problem... a sleeping problem... almost every night he would always sleepwalk, weather it was to the kitchen to get a drink, or anything else. Felix sat up from the floor. still 3/4ths asleep, he couldn't remember where he was, but reasoned that he must have fell off his bed onto the floor. he slowly crawled into the bed right beside where he woke up. unknowingly laying right beside joy. Joy stirred a little, and they both went back to sleep. a regular all around Golden Labrador, always has dark sunglasses on. has a Blu-tooth wireless dog's earpiece. black with red stripes collar, and a red triangle for a tag. The sunglasses 90% of the time cover his eyes, which his left one is blue and his right is greenish blue. Not necessarily mean, but not really the most joyful and nice pet in the world. has no care for any pet that is younger, less rich, less good looking, or less anything to him. and if someone is the same, or better then him at anything, he treats them as if there the same. Hes rich, which is obvious in his attitude. his Blu-tooth earpiece can cause some serious confusion. His owner owns the restaurant chain "Outback Steakhouse" he helps him run it sometimes. and im guessing this color ([color=#800000 ][/color])is available? Last edited by Zander on Mon Jul 12, 2010 3:18 pm, edited 1 time in total. For colors it doesn't really matter anymore since they're pretty much all taken. Just try choosing one that isn't too similar to a bunch of others. No, Neko. There IS a rule that still applies. You CANNOT use a color that looks like the ones you already have. Now, your character here has some things we need to vote on, mainly the fact that he owns a restaurant chain and his owner helps, not the other way around. This is a major deviation from everyone else's characters and belongs alot more in OT, where the owner of the neighborhood is an animal with full-human-rights than BsM where the only place animals have is as pets. You know? So unless you want to change it to "His owner owns Outback, and Matt helps sometimes", I need to see something before I allow this character. there. changed. are you happy? So.... I want to see how fast we can get this day to end, because I want to try a few things, one being having the climate correspond with the actual time. What I'm going to do is tell people when time is progressing. Rikki has a decent list of things he needs to do today, which means two or three arcs of a decent size. I think everyone should be able to time themselves around him or so. When the day ends, we will do a time-skip. I was thinking we'd give ourselves a day or so to have some small arcs within that period, one of which being the dungeon-crawl. Lol, yeah. Don't worry too much. And yes, you should do that. Appearance - Meeka consists of Dark brown fur, a lighter shade of brown for her stripes. She has the typical black mask around her eyes, with her paws being black tipped along with her tail. Her stomach is the brightest part of her body consisting of a light brown. The closest way to describe her eyes is a light purple, she wears a purple collar that compliments her eyes. The tag on her collar is a plain silver circle, and beneath her tag hangs her necklace's pendant(The pendant has a blue gem in its center) . The necklace itself is mostly covered by her collar except for the small part that arcs below it and the pendant. Personality - She is very inquisitive, an explorer. She loved to climb all the different trees in her old neighborhood. She is a bit mischievous, but really smart and always happy to make new friends. At times her curiosity can get the best of her, making her seem blatant or rude when she doesn't really mean to. 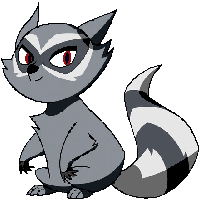 Meeka started out as a wild Raccoon, though she doesn't remember her life as a wild animal or her real parents. Her human parents found her in the woods behind their house, she was wrapped up in a blanket and wearing the necklace she still wear's now. Meeka was barely 6 months old when they found her and with no signs of her real parents. They contacted authorities but the raccoon parents were never found, so the young couple who found her adopted her and raised her. The only thing connecting her to her past is her name and necklace, her name being the only word she knew how to speak when she was found. They raised her, taught her how to read and write, the first words she learned were the one's on her pendant. -When she uses magic you can see small sparks of purple seen shooting from her hands (if she directs the magic with her fingers), or from her whiskers. -Making a potion can have huge effects with little magic use. This is due to the effect that the mix of ingredients do most of the work, the magic simply kick starts the mixture into working. -She hasn't don't much in the area of enchantments, but she has learned that some require a lot of energy, where some do not. -She can store small amounts of energy in the jewel in her pendant. -She knows how to read and write well. -Likes to spend her time running around outside with friends, any outdoor activities in general. -On a rainy day she likes to sit inside and read a good book(Fiction and fantasy stories), or watching anything on tv/movies about fantasy stories or anything involving magic. -She especially likes to read Spell/enchantment/potion books that she buys from magic shops with her allowance. Last edited by CY_Law on Tue Jul 13, 2010 12:53 pm, edited 2 times in total.